At first glance you’d think David Zarett might be looking for a job at The Cobalt Group headquarters south of Safeco Field. With his mop of curly hair, casual clothes and cool sunglasses, he blends in with the young techies building Web sites for auto dealers. But Zarett’s just there to enjoy his handiwork: a former ice factory that the 36-year-old developer converted into some of the most elegant offices south of Pioneer Square. Zarett’s building at 2200 First Ave. S. is a showcase of what could happen to the industrial area around Safeco Field. Speculators, brokers and developers have plans to update nearly every warehouse and vacant lot in the area, and Zarett himself is eyeing other buildings to fix up. The ballpark is drawing new tenants, but the biggest factor in the land rush is rental rates that companies are willing to pay, Zarett said. Just since Cobalt signed its lease last fall, rates have gone up 30 percent, he said. “If you had a building that was vacant, you’d be making a ton of money,” he said. Zarett got his start fixing up older buildings in Pioneer Square and Capitol Hill. He bought them after moving to Seattle in 1992 from Los Angeles, where he learned the business working as a commercial real-estate broker. He also bought and restored an old house in Wallingford and bought another building farther south in the Duwamish. When Zarett found the Diamond Ice building in 1997, it had holes in the floors, rotting beams and had been condemned by the city. After nearly three years and $10 million worth of work, Zarett opened the doors in January to The Cobalt Group, an Internet company that moved there from offices by the Pike Place Market. Cobalt has 300 employees on the top three floors. The first floor is leased as Starbucks offices. Cobalt CEO John Holt said the building was 20 percent less expensive and had more parking than downtown offices. It also had a desirable open floor plan. Cobalt’s offices also have nearly a century worth of charm. Brick walls and enormous old-growth timbers were sandblasted clean and shored up with spare steel girders. A mix of new and old windows also provides sweeping views of the city. A gym, auditorium and underground garage were added in spaces that used to house refrigeration equipment, some of which became decor. “I’ve worked here two months and I feel sentimental about the building,” said Kathy Lapp, Starbucks regional coordinator and the building’s unofficial historian. Lapp tracked down former storage workers who tell stories of crashing forklifts, creaky equipment held in place by towers of built-up ice and blood dripping through the floors of a pet-food company on the second floor. Before that, the business sold ice when people still had iceboxes, and stored fish, butter and produce loaded from the rail spur out back. 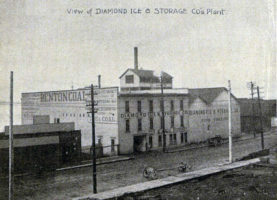 The cold-storage business moved out in 1993 and the building fell into disrepair. It was reportedly used by Nirvana for band practice, and by others for rave parties. Zarett and others say there aren’t many such buildings left, because Seattle never had a big warehouse district like those in East Coast cities.